Those who know me well know that I am a staunch anti-consumerist who bangs on about reducing, re-using and recycling as much as possible. If there is one thing that drives me absolutely insane, it is blatant waste of resources and food. I lived in a suburb of Melbourne called Carnegie for a few years before moving back to Sydney, and it turned out that Carnegie is famous for the unwanted stuff people put out on the street, otherwise known as “hard rubbish”. No matter where you walk in Carnegie, you will find something someone has put out on the nature strip, whether it be a bag of clothing or an office chair or something totally obscure like a vintage radio. The intention is that someone will pick it up and that’s what usually happens. In the four years I lived there and spent walking my baby son around the streets, I found all manner of items, some of which I took home and most of which I donated to the local op-shops. The reason why this system works is because The City Of Glen Eira, and hats off to them, have no scheduled council clean ups where you are given a weekend to put your stuff out and on the following Monday it is collected by a giant compacter truck which crushes the items into dust and debris to be tossed into landfill. 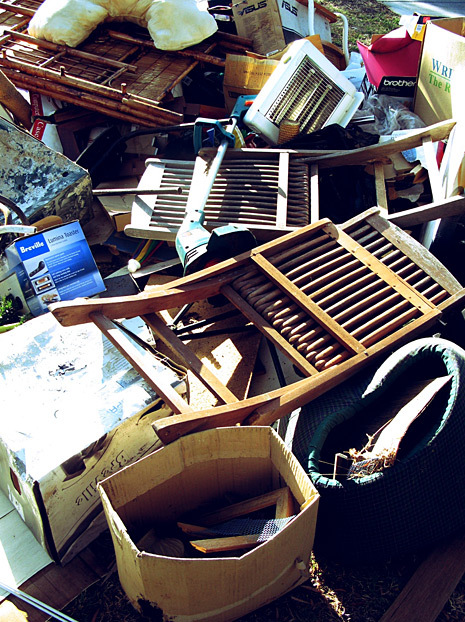 Every household is given three hard rubbish pick ups a year. You get all your trash together, call the council and they pick up a few days later. That usually means residents only put out stuff that really needs to go to the tip, not perfectly good items which can be put to good use by a charity, or by you or I. 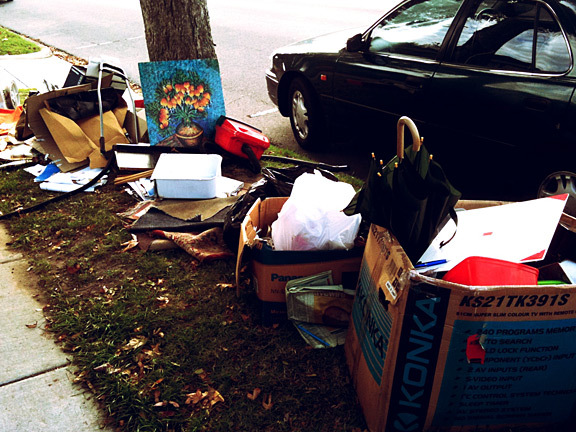 The downside of this method is that the streets can be unsightly with piles of stuff in nearly every street. But no one pile is ever there for very long. Which brings me to the point of this post. A year ago I moved to Sydney’s Northern Beaches, a beach-y family oriented part of Sydney, argued by some to be the best part of Sydney to live. The people on this side of town are very friendly, there are loads of families and elderly and people actually for the most part say hello on the street. But for all their good points, the waste created by the residents on my side of town is really surprising. The council clean ups are weekly around here, with each street averaging two clean ups a year. I have become somewhat obsessed with them because the stuff I’ve been finding in the piles left out on nature strips have been shocking. I mean, not shockingly bad, but shockingly good. But what infuriates me is that the multitudes of kitchen appliances, bags of clothing (clothes still with the tags attached are not unusual), barely worn shoes, children’s toys, books, baby goods, homewares, you name it are all destined for the local tip at Mona Vale to be crushed up and tossed into landfill. I think about kids in countries who have very little, like these kids in Africa who make toys out of scrap metal and plastic and I become deeply saddened. It seems I’m not the only Northern Beaches resident concerned with this issue. Wendy Harmer, comedienne and author (whose portrait you can see on my people portfolio page) who lives on Collaroy Plateau about ten minutes from my house, wrote an article on it and has the exact sentiments as my own. Why can’t the items be neatly bundled up and donated to charity? Why is it so hard to ring Vinnie’s or the Salvo’s and have them pick up? Leave the stuff out in the driveway for Pete’s sake, you don’t even need to be home for a charity truck to pick it all up and generate much-needed funds from it. Then someone, and the planet can benefit from it not ending up in a big whole in the earth. So in closing, I’ve decided to create some good from the piles of trash I see on the street. Aside from taking most of what I find to charity, I have been collecting kitchenware and cookbooks from the kerbside and bringing them home to write posts about. The first two have already appeared, Cajun & Creole Cooking by Terry Thompson, and 500 Salads by Susannah Blake. I might even write about a 1980’s Ronson rechargeable parmesan cheese grater I found in the original box on my street. I guess some things are better off out of the house, especially non-essential gadgets which clutter up the house. They just don’t belong in council clean-ups. Words and pictures by Tanya Zouev.